Can I have a longer bridge cable? The cable must utilize 4P4C jacks on its end. 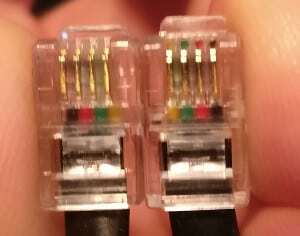 The cable must feature 4 wires to connect each of the 4 pins of the jacks. The cable should be as short as possible. The longer the cable, the higher the chance communication problems between the keyboard halves will occur. If you need a long cable, use a straight cable instead of a spiral cable to minimize overall cable length. Then you can go as long as about 3 meters.